I did it! I went and organized that drawer. While I was at it, I sorted out part of the counter top and bagged up an entire grocery bag full of groceries that I'm going to post on freecycle here in just a minute. There are packets of crystal lite (discovered I can't have them because of the aspartame), containers of lemonade drink mix (I didn't need 6!) and some canned goods. 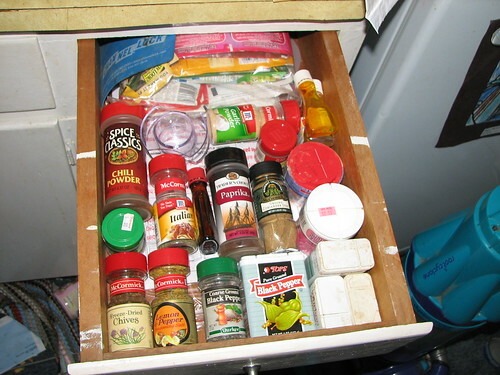 oooohhh, nice job on the spice drawer! looking good! i sorted my spice basket the same day you did this!